So many babies! I don’t have profiles for all the wrestlers but I will soon! You can click on the names above to go to their profiles if I do have one made. We begin the show with two rookies from two different promotions. Nagasaki has slightly more experience, she debuted in Ice Ribbon on September 6th, 2015 and has already been in several big matches (she hasn’t won any important matches but still has the experience). After a few exhibition matches, Yuina officially debuted on January 31st, 2016 in REINA and has been wrestling in opener-style matches since then. Yuina’s posing confuses Nagasaki temporarily, but they then get down to business and start trading wristlocks. Dropkick by Nagasaki and she scoop slams Yuina a couple times before covering her for two. Crab hold by Nagasaki, but Yuina gets to the ropes to force a break. Elbows by Yuina but Nagasaki dropkicks her, Yuina dropkicks her right back and she covers Nagasaki for a two count. Crab hold by Yuina but Nagasaki gets into the ropes, scoop slam by Yuina and the pair trade elbows. Jumping crossbody by Yuina but Nagasaki avoids her legdrop, backslide by Yuina but it gets two. Yuina goes off the ropes but Nagasaki slams her to the mat, Marunage by Nagasaki and she gets the three count! Nagasaki is the winner. Really basic, obviously, but both look trained and competent. I have been impressed the few times I have seen Nagasaki, she seems to be off to a good start and Ice Ribbon has a solid track record with younger wrestlers. Still too early to tell on Yuina, but no issues here, not a bad way to start off a card designed to highlight younger wrestlers. Neither one of these two wrestlers are rookies, but Katsu is still a young wrestler at only 21 years old. Nihonbashi is in her fourth year and is a comedy wrestler, so this match will likely not be overly serious. Katsu is affiliated with JWP, while Nihonbashi is a wrestler from Daijo Pro, so another inter-promotional match on the show. Doing play by play on a Fairy Nihonbashi match is never easy or logical, since a bulk of the match is Nihonbashi dancing around and trying to get her opponent to play along. Nihonbashi tricks Katsu and applies an inside cradle while they are still playing around, leading to Katsu attacking Nihonbashi and throwing her into the corner. Nihonbashi gets her wand and demonstrates how it works by throwing the referee magically with it. Katsu doesn’t look impressed but eventually does flip for the wand, cover by Nihonbashi but it gets a two count. Nihonbashi slams Katsu’s head into the mat repeatedly but Katsu blocks the scoop slam and hits one of her own. Crab hold by Katsu but Nihonbashi gets to the ropes, Nihonbashi slides away from Katsu but Katsu hits a hard elbow. Crab hold by Katsu, but Nihonbashi gets into the ropes. Samoan Drop by Katsu, but Nihonbashi reverses it into a crucifix pin for two. Katsu fires up, she hits a backdrop suplex but Nihonbashi barely kicks out. Katsu gets on the second turnbuckle and delivers the Reverse Senton, picking up the three count! Manami Katsu is the winner! 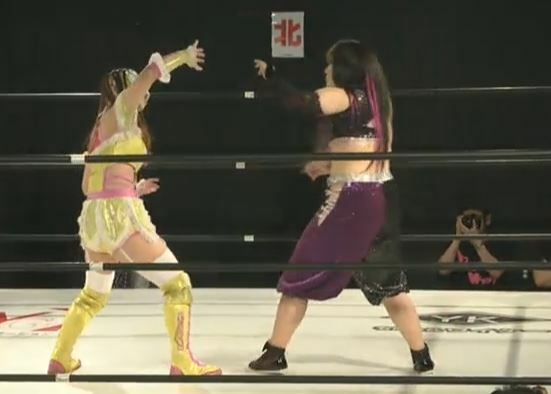 I am not a huge fan of Fairy Nihonbashi, there is only some wrestling comedy I enjoy and I think her act has gotten a bit old since every match is basically the same. Katsu hit everything well here and looked solid, but it just took too long to get going. Not my thing, but if you like Nihonbashi then you may enjoy it. This is a fun collection of wrestlers. Fujita is in her third year in Ice Ribbon but still is doing midcard matches, while Yamashita is only two years into her career over at Daijo Pro but has seen by far the most success of everyone on this show as she is being groomed as a future ace. On the other side, Kadokura is the newest wrestler on this card as she just debuted on May 3rd, 2016 in Marvelous. Fujigasaki is a 19 year old wrestler from JWP and has been wrestling almost three years. This match is clearly Yamashita’s to win as she has been getting a big push in Pro Wrestling WAVE, but hopefully everyone else will get a chance to shine too. Yamashita and Kadokura start for their teams, scoop slam by Yamashita and she knocks Fujigasaki off the apron before tagging in Fujita. Yamashita immediately comes back in the ring as they double team the rookie, cover by Fujita but it gets two. Yamashita is tagged back in as they take turns on Kadokura, but she finally manages to make the hot tag to Fujigasaki. Fujigasaki has some luck for a moment but Fujita trades elbows with her and hits a suplex. Lariat by Fujita in the corner but Fujigasaki hits a missile dropkick and tags Kadokura back in. Dropkicks by Kadokura, and she covers Fujita for a two count. More dropkicks by Kadokura and she scoop slams Fujita, Fujigasaki returns but Fujita shoulderblocks both of them and slams Kadokura to the mat. She tags Yamashita, shoulderblocks by Yamashita and she covers Kadokura for two. Lariats by Yamashita in the corner, Kadokura fights back with elbows but Yamashita sends her back to the mat. Dropkicks by Kadokura but Yamashita fires back with elbows, Kadokura sneaks in a schoolboy but Yamashita kicks out. Scoop slam by Kadokura and she hits a Frankensteiner, but it only gets a two count. Fujigasaki goes up top and hits a missile dropkick, she then hits another one for a two count. Fujigasaki goes up top once again but Yamashita avoids the splash and kicks Fujigasaki in the chest. Dropkick by Fujigasaki, Kadokura runs in and she dropkicks Yamashita as well. Yamashita comes back with a backdrop suplex on Fujigasaki, dropkick by Fujigasaki and she hits rolling Northern Lights Suplexes. Fujigasaki goes up top and hits a swivel body press, but Fujita breaks up the cover. Fujigasaki goes off the ropes but Yamashita levels her with a lariat, sliding lariat by Yamashita and she gets the three count! Akane Fujita and Rina Yamashita win the match. This one started really slow, like reaaaalllly slow and Kadokura is clearly a work in progress, but the last few minutes were entertaining as the pace picked up. Yamashita probably is too good to be in this type of match but since she is still early in her career I guess it still made sense, although she was better than everyone else by a significant margin. I did like Fujigasaki firing up a bit and showing some personality, and the match did get enough time as it was the longest match of the night. More good than bad, but just barely, even though I do like seeing wrestlers like Kadokura when they first start their career. We finish off the show with two quality young wrestlers, both of which I like a lot. Takumi started her training in Stardom but left the promotion in January of 2015, around the time that Stardom had quite a few wrestlers leave for a variety of reasons. After she left Stardom she joined up with Marvelous and was taken of the wing of the awesome Chigusa Nagayo. The downside of her joining Marvelous is Marvelous doesn’t run shows/make TV very often so Iroha has been a bit under the radar. Kaho is the opposite of ‘under the radar’ as she wrestles everywhere, as she has a prominent role in Pro Wrestling WAVE, OZ Academy, and Asuka Project. Kaho has had more success in her short career but Iroha has been pushed hard in Marvelous (including having 15+ minute matches with Meiko Satomura and DASH Chisako), so it is anyone’s game. 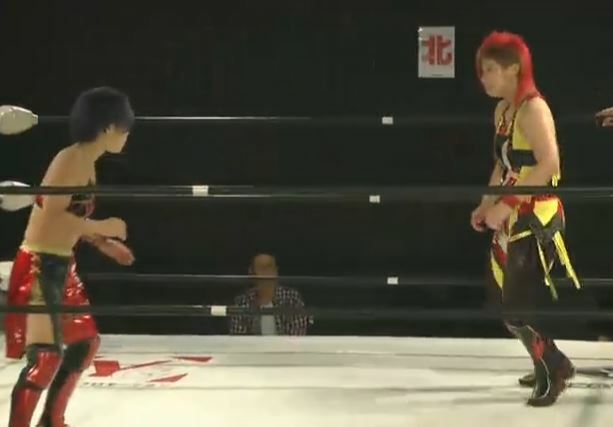 Iroha and Kobayashi trade a few holds to start but quickly get into it as they trade armdrags. Dropkick by Kobayashi but Iroha kicks out of the cover and they return to their feet. Bodyslam by Iroha and she puts Kobayashi in a crab hold, but she makes it to the ropes for a break. Kick by Iroha and she stretches Kobayashi, Irish whip to the corner by Iroha and she hits a backbreaker for two. Kobayashi quickly applies an ankle hold but Iroha kicks out of it, kick to the back by Iroha but Kobayashi elbow her and they trade blows. Kobayashi dropkicks Iroha in the leg to get her to the mat before dropkicking her in the face, leglock by Kobayashi and she slams Iroha’s knee into the mat. Kobayashi goes back to the ankle but Iroha gets out of it and hits a superkick. Butterfly suplex by Iroha, and she covers Kobayashi for two. Uppercut by Iroha but Kobayashi dropkicks her into the ropes and hits a fisherman suplex hold for two. Ankle hold by Kobayashi with a grapevine, but Iroha gets in the ropes to force a break. Kobayashi charges Iroha but Iroha catches her with a kick combination before hitting a German suplex hold for two. Back up they trade elbows, Kobayashi goes for a hurricanrana but Iroha catches her and applies a single leg crab hold. Kaho gets to the ropes, she sneaks in a few quick pins but Iroha kicks out each time. Kobayashi goes off the rope but Iroha catches her with a jumping heel kick for two. Iroha gets Kobayashi up but Kobayashi slides down her back, Iroha connects with a high kick and drops Kobayashi with the Running Three. Cover by Iroha and she gets the three count! Takumi Iroha is the winner. Needless to say, this type of show is really only for certain types of fans. With only 40 minutes of action, and no ‘name’ wrestlers, for the casual fan this event doesn’t have a ton of value. If you enjoy watching young wrestlers however, or rookies still learning the trade, then this show may be the one for you as young wrestlers from multiple Joshi promotions participated. The main event was shorter than I’d prefer but still was special match as both are on the upswing in their careers and it was a unique pairing. Skippable for most but it achieved its purpose of giving the younger wrestlers a chance to shine on their own event.